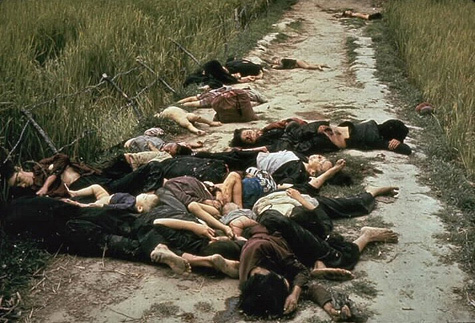 We are deeply grateful that a cease-fire has been signed in Laos and South Vietnam yet at the same time we are painfully aware that these documents do not mean peace for either the South Vietnamese or the Laotians. As late as March 1, reports in the New York Times comment that: “The overriding reality of Vietnam, a month after the ostensible arrival of peace, is that virtually nothing has changed” (Feb 22, New York Times). Saigon is a place of horror where a government of limited scope has been driven to insanity by the threat of its own failure. Our involvement now is that we are providing civilianized management for Vietnamization and all the tools and money necessary for a perpetual war. A police force of 120,000, up from 16,000 in 1963, carries out the neutralization (Phoenix) and pacification programs organized by U.S. resources. These were created and built by American firms and payed [sic] for by American taxes. The latest Decree-Laws of South Vietnam state that any neutral person will be considered pro-Communist. This places the pacifist Buddhist Church, a large majority of Catholics and inumerable [sic] students who have taken an objective, neutral stand, under constant danger of arrest. Though these and other Decree-Laws allow the South Vietnamese police to arrest almost anyone who expresses active or verbal opposition to official policies, the Saigon regime issued another Decree-Law (Art. 19) which states that no trial is required and no appeal allowed. Perhaps Vietnam can be considered one country by North Vietnam but are Laos and North Vietnam one country? Are Cambodia and North Vietnam one country? Should over 60,000 North Vietnamese troops in Laos be condoned simply because they are North Vietnamese? Liberation is at stake? Whose liberation? And from what? Perhaps liberation is needed from both North Vietnam and the United States. And perhaps the United States and Russia should stop playing Russian Roulette with the lives of other people. Few if any lasting gains have been gotten through the violence of the past years. What violence begets is more violence—and violence as we have seen knows no limits. The United States has succumbed to the most dehumanized types of violence in the name of stopping violence. North Vietnam has built its growth and existence on violence. It is our dream and our deepest hope that all sides will some day regain their humanity and realize what they have done. Let North Vietnam return to its boundaries. Let the United States stay on its own continent. Let all who want peace but continue to say it is impossible, come together to build the non-violent alternatives which will make peace possible. Nothing is impossible for people who will put their love into action.